The Steven Universe vinyl set includes 37 tracks across four 10" translucent records. Each record represents a Crystal Gem, with Garnet, Amethyst, Pearl and Steven each getting their colored disc. The soundtrack was released globally last year. “Steven Universe Vol. 1 is a one-of-a-kind animated opus, fusing musical celebration with storytelling in a way that inspires nothing short of spectacular smiling. Its songs are lively, jubilant and often emotional works of aural art, spreading a sensation of total glee to all ears within listening distance,” reads the official product description. 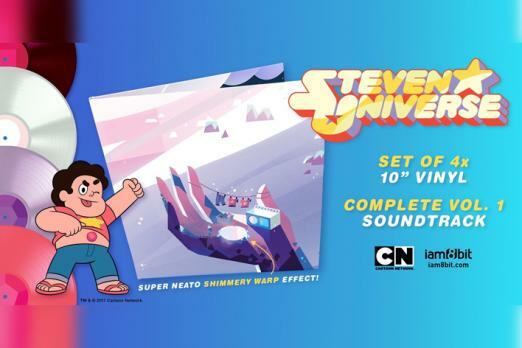 The 4-disc vinyl set was designed in close collaboration with series creator Rebecca Sugar as well as illustration artists Chromosphere. The inset features art of the Crystal Gems trekking across a stylized landscape. The 4-disc set is now available on iam8bit.com for $49.99. For more soundtrack magic, you can get a look at some of Sugar’s behind-the-scenes thoughts about closing track “Love Like You” via an io9 video exclusive here. In other news, the complete first season is now available on DVD for the first time (Amazon). There’s also a new children’s book, “Fusion For Beginners and Experts,” available as well (Amazon). Have you picked up the Steven Universe soundtrack on vinyl or are you more of a digital music collection type of person? What other merch are you hoping to see from the Steven Universe team? Just want more episodes? Feel free to let us know in the comments section below.